Disputes between tenants and landlords are by no means uncommon. While many can be resolved through communication between the two parties and resulting in mutual agreement about the issue, tens of thousands of court case as files each year in the U.S. by renters and the person(s) they rent from. When you rent the space you live in, you enter into a legal agreement with the landlord, property manager, or property owner of the dwelling. To keep it simple, we’ll use the term ‘landlord’ in this article. It all begins with the lease. Help! I’m in a dispute with my landlord. What can I do? As a tenant, it is imperative that you and your landlord realize the legal rights and responsibilities you are each entitled to. These items are stipulated in the lease, and as you and your landlord enter into a new lease together, it is imperative that you, the tenant, know exactly what terms, conditions, and provisions are contained in the lease. If there are things in the lease you don’t understand, ask the landlord to explain them to you until they are clear. Ambiguity and leasing don’t mix, so read your lease from beginning to end until you fully understand the stipulations of the agreement. Doing so will help prevent disagreements down the road. If you’ve already begun your rental term and are having landlord issues. Although the landlord is not required to pay for utilities, water, gas, or trash pickup, some do. These provisions are dictated by the landlord’s discretion and must be included in the lease. Is my landlord liable injuries that occur to myself or my guests? It is the responsibility of the landlord to maintain the safety of the entire property for tenants and their guests. Landlords can be held responsible for injuries caused by hazardous or defective circumstances on the rental property, criminal activity, and environmental risks (i.e. asbestos). What if I am sharing a property with a roommate and something goes wrong? Tenants who share rental responsibility of the same property have obligation to each other in addition to the landlord. There are further legal issues you must be aware of when living with others in regard to when they want to bring someone else in the rental picture, when that person moves in, and when they decide to leave. Also, most landlords require that everyone living in the property (except children under 18) must sign a lease, so if you bring in a roommate during your tenure, you should let your landlord know to avoid future trouble. My landlord is trying to evict me. Does she have the right to? 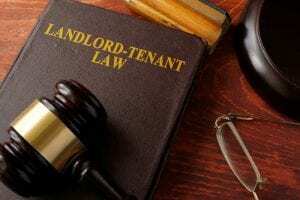 A landlord reserves the right to terminate a lease if the tenant fails to pay rent, violates the pet policy, or continually disturbs other tenants or neighbors. However, most landlords take a variety of circumstances into account before deciding to evict a tenant. Often, through communication and respect, the dispute can be resolved, eliminating the need to complete the eviction process. Is there a limit to the amount of rent and security deposits my landlord can collect? Landlords are allowed to set rent at whatever fee they decide so long as they do not fall under specific areas covered by rent control. However, many states have parameters in place that dictate how rent must be paid and how it can be raised. State law strictly governs security deposits and determines how much money a landlord can demand up front and how the funds can be allocated (i.e. covering unpaid rent). Make sure you notify your landlord long before you plan to leave, and do so within 30 days if at all possible. This way, your security deposit should be available and ready to return to you. My landlord is trying to keep a portion of my deposit for something. What can I do? It all depends on what the landlord is claiming the funds for. It can range from damage he or she is claiming you left behind, claims that you failed to leave the property in a clean and satisfactory condition, or for back rent or late fees the landlord claims you owe. In these situations, communication between tenants and landlords is imperative, and can often solve the issue. However, if neither you nor your landlord will budge on your position, legal action may have to be taken, as there are certain things landlords can – and can’t – keep deposit money for. These rules vary by state, and the lease you signed generally plays a huge role in determining who is right, another reason you’ve got to really read and understand everything in your lease before you sign it.